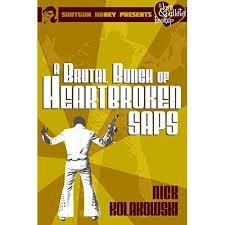 I just turned the final page of Nick Kolakowski’s, A Brutal Bunch of Heartbroken Saps from Shotgun Honey and I am left with the feeling that I will watching out for his next book every day until news breaks it’s coming out. This novella is a lightening quick read and it’s full of memorable characters, great witty dialogue, and a plot which never lets off the throttle. The plot is a strange one to sum up, as it’s simple in many ways, yet has quite a few complexities that keep the reader guessing where Kolakowski is taking them next. Bill comes to and finds himself chained up and dangling upside in an apparent robbery attempt. His backstory emerges that he has tried to rob a syndicate of a lot of money and make himself nothing more than a memory. In his attempt to vanish, car trouble forces him to stop in a rundown town and trouble ensues. 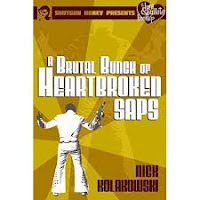 He finds himself running from a crooked sheriff, a former lover may or may not be planning on killing him, and hitmen sent by the bad guys to retrieve the stolen money. Violence, hilarity, and a shitload of fun for the reader follow in short order. I have to be honest, Kolakowski is a brand-new author to me. A bit of research tells me he has written some short stories in a few anthologies I have read, but for whatever reason, none of his stories have stuck with me. Sometimes all you need is more an awareness of an author to enjoy their work on a more personal level, so I am making it my business to seek out some of his older work and dive in. I have his noir collection, Somebody’s Trying to Kill Me, locked and loaded on my E-Reader, so I am anticipating a great weekend of reading in the near future. With the warmer weather approaching, and a few beach days on the horizon, you would be doing yourself a favor to grab a copy of this novella and enjoy it in one sitting while you nurse a cold one.